CORRECTION: After a recent TV debate on Islamic & Muslim divorce practices, I had mistakenly believed that Aisha Ali Khan was an ex-Muslim. She denies this, and in the interests of accuracy, I’m happy to apologise for my mistake and retract it fully. Yesterday I attended a live TV “debate” on the (in)famous “The Big Questions” on BBC 1 to discuss two topics, one related to whether there should be some controls on Gambling, and another, on whether some *communities* (i.e. religious communities) ignore human rights or merely “pay lip service” to it. The video of the event is below the review. Now before I mentioned briefly about what happened in the show, many people notice that the show’s host, Nicky Campbell is not exactly, shall we say, completely even-handed in his managing of the debate programme. It is measurably evident that more time is given to the narratives the show wants to support (usually secular and liberalist ones if religious opinions are being discussed). It is also measurably true that speakers of orthodox religious opinions that counter secular liberal worldview are subject to more interruption by Nicky, or interruption allowed by Nicky from secular liberal guests. Many Muslims view this has an unfair platform, and some Muslim speakers have even declined invitations to the show in recent years. However, I view things a little differently. With the exception of public debates (many of which are organised by Muslims themselves, like our organisation the Muslim Debate Initiative), since when have Muslims had a fair platform to promote the truth when they were the minority? If Muslims waited for a fair platform to defend the Muslim community and Islam from heinous distortions, and share the message of Islam, we’d never appear on any platform at all – well, except the ones we hold for ourselves, but that would simply be ‘preaching to the converted’ as the English idiom goes. The reality of the situation of Muslims in the West, the non-Western countries (including increasingly in the Muslim world), is that Islam and Muslims are continually on trial in the media. Whether they use the word “Islamism” instead of “Islam” (but mean Islam), or call mainstream Islamic beliefs “extremism” and irreligious non-practitioners or apolitical pseudo-ascetics to be “moderate”, Islam is nevertheless on trial in the mass media, and the minds of the public of the world are the target. Of course, they don’t hate the label “Islam” – they just want it to be slapped onto a new ideology which is secular liberalism in politics and liberal in theology. Sure, Muslims should strive to create our own media platforms, but no matter how many we make, we can’t control the much bigger global media platforms from pumping out vastly more content on Islam and Muslims. Therefore, if Muslims don’t make an effort to contest those platforms when offered, it is like no one turning up to your own trial to argue in your defence. It might be an unfair trial, but the Quran and hadith are replete with examples and stories of Prophets [A.S.] standing up to their own people and speaking the truth. Indeed one of the duties of Muslims is the be witnesses to the truth to mankind – which means always showing mankind guidance and an alternative to their fellows – even if they don’t accept it. Those who were saved amongst the town of the sabbath breakers argued as their first reason for admonishing their fellow townsmen, that by speaking the truth they hoped to not share in the punishment of there fellows. In essence, their first concern was not convincing their fellows to change their ways, but to merely save themselves by dissociating themselves – by words – from the sabbath breakers. On the day of judgement, when the erroneous people argue that they committed sins and errors in ignorance, those Muslims who acted steadfastly as witnesses to mankind will be called upon to give evidence. It is probably then, that those who reject truth will realise that they never were really putting Islam on trial, but rather it was they themselves who were on trial all along. This question started out with a sad story of a bereaved mother and father who had lost their son to suicide after he became severely depressed due to his gambling habit. The discussion then featured many ex-gamblers discussing the need to control gambling advertising and prevent exploitation of the youth. Some argued the old trite “education solves everything” position, gaining an easy and cheap gained applause, arguing that youth need more education about the effects of gambling. Some of the attendees were professional gamblers (usually of the kind who play poker against other players or bet at horse races), who argued that gambling can be indulged in “moderately” without any bad effects. An editor for the “centre-left” Spiked Magazine argued that the other guests were just using the cases of badly affected youth as “outrage tactics” to get gambling more regulated than it needed to be. I noted that throughout, no one, even the recently bereaved parents who lost a son never argued for the obvious – why is Gambling legal? Even Salma Yaqoub, spokesperson for Birmingham Central Mosque, campaigner for Stop the War Coalition, didn’t argue the Islamic case that it would be better if gambling was banned. Now to be fair, she did clarify to me after the show that she was not saying that gambling is halal, only that she was speaking in the context of the UK, and trying to present a pragmatic solution in a liberal environment, against the deleterious effects of gambling was to argue for more regulation. Others also made similar arguments and spoke about finding some way to limit corporations from using the sheer scale of means they employ to exploit the poor and entice the weak into crippling debt, mental health problems and spiralling addiction. I, however, didn’t follow suit. I simply pointed out that the “education solves all” approach has only a limited effect because humans are (sadly) not entirely rational creatures and no amount of education would stop youthful curiosity or an already addicted gambler, as much as education would work against drug addictions (or any other kind). I followed through with authoritative statistics of the horrific effects of gambling, the enormous debt it causes the poor, and added a “philosophical” observation (i.e. argument from first principles) to the fact that gambling goes against the very purpose of economics, which is the distribution of wealth and services through exchange – something gambling doesn’t do, but instead it is merely a parasitic blight on the wealth of the poor. I argued the “Abrahamic” position, that gambling should be banned. If it causes many bad effects and is proven to be as addictive as illegal drugs, why not ban it equally? Of course, the two main sides of the debate, the anti-regulation gamblers and the pro-regulation gamblers, tried to argue against a full-on ban – but I pointed out that you can’t make arbitrary regulations that allow low-level gambling but regulate corporations from making a profit from essentially the same activity. No one had any arguments or come-backs. It’s a shame that I wasn’t supported in stating the solution of a ban, by the Christian and Muslim colleagues that were my fellow guests – another example wing-person failure par excellence. Predictably, this title of this questions was directed at the Muslim community, but also the traditional Christian community too (on some matters). There were one ex-Muslim, Imtiaz Shams, and another participant, a feminist campaigner who has criticised Islamic practices of divorce, Aisha Ali Khan, and another feminist, Sharon Jagger,an individual who seemed to me to be expressing opinions critical of religion from an atheist perspective. These guest were brought on to presumably to counter-point myself, Salma and the Christian religious perspectives. Nicky introduced the question and began challenging the Christian speaker on her claims that Christians have been subject to maltreatment by the UK state for airing their Biblical views on Homosexuality (a lady, who seemed quite bigoted against Islam – so much for Abrahamic solidarity in the face of secular intolerance). Nicky then brought in an ex-Muslim, part of Humanists UK, Imtiaz Shams, and another guest, a member of Feminist Zealots, Aisha Ali Khan, who immediately began speaking about the problem of forced marriage, and unequal treatment of Muslim women seeking divorces in Islam, compared to the ease of men’s ability to get divorce in Islam. After I pointed out that Islam forbids forced marriage, and for them to continue asking the question on whether certain communities respect human rights laws in the UK is moot since the law of the land is enforced by the police and courts – it’s not like anyone has any choice in the matter, minority or not! I also pointed out that anyone who gets forced into marriage, according to Islam (and the law of England and Wales) their marriage isn’t valid and is instantly annulled without any process or sharia council ruling. I then pointed out something Nicky and Aisha didn’t like, not one bit. In Islamic law, if a woman is not happy in a marriage, she has the right to divorce. BUT, in the law of England and Wales, if a woman is unhappy in her marriage, and that is the reason for her divorce – if the husband doesn’t want to accept her petition, the law of England and Wales does not give her the right to divorce for that reason! Yes, it’s completely true. Salma Yaqoub, to her credit, brought up the case of an English court refusing a woman’s petition for divorce, but didn’t explain the reason behind it or the law – I, however, did….followed by my question why they were attacking Islamic law that actually gives better rights to women than English law does. Immediately after I said that all hell broke loose with Aisha shouting and interrupting me mid-sentence, and Nicky allowing it and joining in. They clearly didn’t like the fact I had turned the tables on them and their beloved “human rights law” of England. I, however, wasn’t going to be interrupted until I had finished my sentence, and then Nicky tried to make it look like I was “shouting over a woman” and “mansplaining” lol. All this, despite the fact that the microphone caught Aisha mockingly taunting in smug confidence (while hiding behind Nicky’s support), “apologies if my shouting hurt your feelings”. Later in the show, she then complained of men interrupting her! And of course, with Nicky’s support. I was quite amused by this and asked Nicky to do his job and maintain order, and asked him why he was not preventing Aisha from rudely interrupting people (especially considering I hadn’t interrupted her). But of course, these are the tactics they had to resort to, as those who lack rational arguments only have shouting, insults and jibes in lieu of any intellectual content. Regardless, their interruptions didn’t stop me making my points and calling them out on their false claims against Islam and Muslims. A worthwhile endeavour, even if, as always, the platform isn’t unbiased or fair – but that is what the Daee must learn to be able to deal with, which is what Dawah requires. It’s actually shocking how biased Nicky Campbell is, the pain he suffers whenever you debunk his ideas and values is evident in his mannerisms. Well done for pushing through their ignorance. “Lo! falsehood is ever bound to vanish.” , Quran 17:81. Cant wait to search of after work. Amy Allah rawad jou and increase your sabr and knowledge. 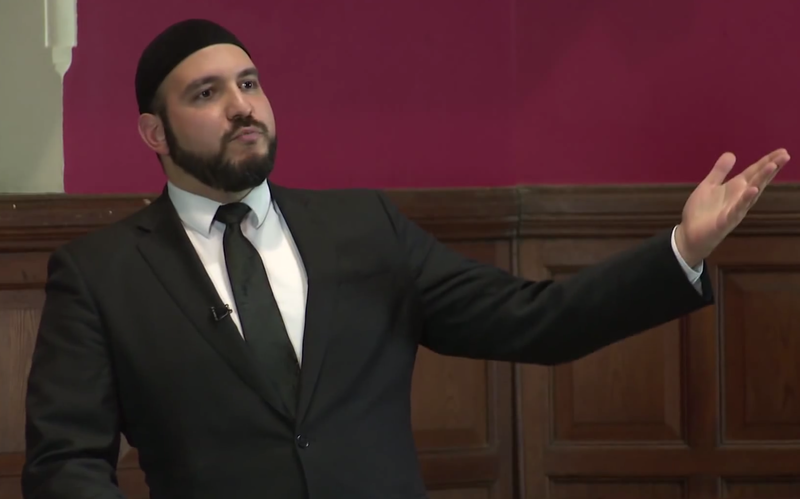 Ma Sha Allah brother, you did a great job in representing the correct Islamic standpoint on the topics discussed, even with the odds being against you, Nicky clearly and deliberately tried to make you out to be an angry, ill mannered guest during the heated to and fro with Aisha, when you were providing valid counter arguments to their misconstrued views on Islam. Well done brother, a great asset to the ummah, may Allah reward you immensely. The second debate was trash. Much talk with little substance. The parts where Abdullah was allowed to talk were the only ones worth listening to.